Coho salmon are once again navigating the waters of the Wenatchee and Methow rivers. Coho were essentially eliminated from these river systems during the 20th century. Impassable dams, overfishing, unscreened irrigation diversions, habitat degradation, and hatchery policies all contributed to the virtual disappearance of coho in these two mid-Columbia river systems. Prior to the 20th century, an estimated 120,000 to 165,000 coho returned annually to mid-Columbia rivers—the Yakima, Wenatchee, Entiat, Methow, and Spokane. Recognizing the losses that occurred after dams were built in the mid and upper Columbia, the Yakama Nation began an aggressive program to restore coho. The Yakama Nation began reintroducing coho to the Methow River in 1997 and the Wenatchee River in 1999. The tribe used the only coho stock available, an early-run, lower river coho. With an innovative supplementation approach that acclimated the juvenile coho to spawning areas, the Yakama Nation has rebuilt Wenatchee and Methow coho runs and put more adults back into the spawning grounds. Within a few years of reintroducing coho to the Wenatchee and Methow, the Yakama Nation began replacing the lower Columbia fish with juveniles produced from a portion of the inbasin returning adults; the other fish were allowed to pass upstream for natural spawning. By choosing these fish with the demonstrated ability to migrate the many hundreds of miles out and back from the ocean, past seven or more dams, and home back to their mid-Columbia tributaries, the tribe hoped to create a broodstock that was better adapted to local conditions. Within a few more years, returns were sufficient to complete the transition to strictly inbasin broodstock. As anticipated, survival rates for smolts from this new localized broodstock have been greater than for lower Columbia River smolts, providing evidence that the naturalization process is indeed taking place. The tribe has also seen an increase in redd counts over the years, and analysis indicates that a growing proportion of the adult returns are the product of natural spawning. As their numbers increase, these natural-origin fish will replace the hatchery-origin fish in the broodstock, which will further promote naturalization of the stock. Since the program’s inception, total adult coho returns to the two basins have ranged from 1,751 to 30,341 with a 10-year average of 8,576 fish. Significantly, adult returns in 2009 were at a record high (since the mid-1900s) and deemed sufficient to open a limited tribal and non-tribal fishery in Icicle Creek, a Wenatchee tributary. It was the first fishery in over half a century. Another record return— almost twice that of the 2009 record—occurred in 2011. A fishery was opened not just in Icicle Creek, but in the lower Wenatchee and Methow rivers as well. Dramatic increases in annual returns, including natural-origin coho, have been accompanied by increasing numbers and distribution of redds. Partnerships with Grant County and Chelan Public Utility Districts and the Methow Salmon Recovery Foundation have helped make this restoration project possible. Sportsfishers, tribal members, and non-tribal commercial fisheries are now sharing in the benefits. Similar coho reintroduction and restoration have occurred in the Yakima and Clearwater river basins. 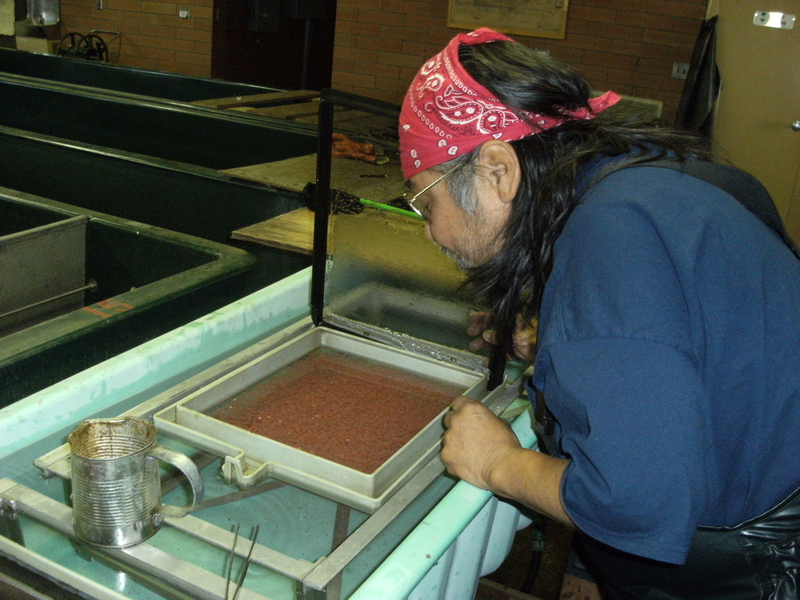 Both the Yakama Nation’s Yakima River Coho Re-Introduction Study and the Nez Perce Tribe’s Clearwater Coho Restoration Project are successful with results comparable to the Wenatchee/Methow program. Despite starting with out-of-basin hatchery stock, the Clearwater, Yakima, Wenatchee, and Methow rivers are seeing increasing returns of natural origin coho—fish that are adapting to their new environment and establishing spawning populations in new habitat areas. 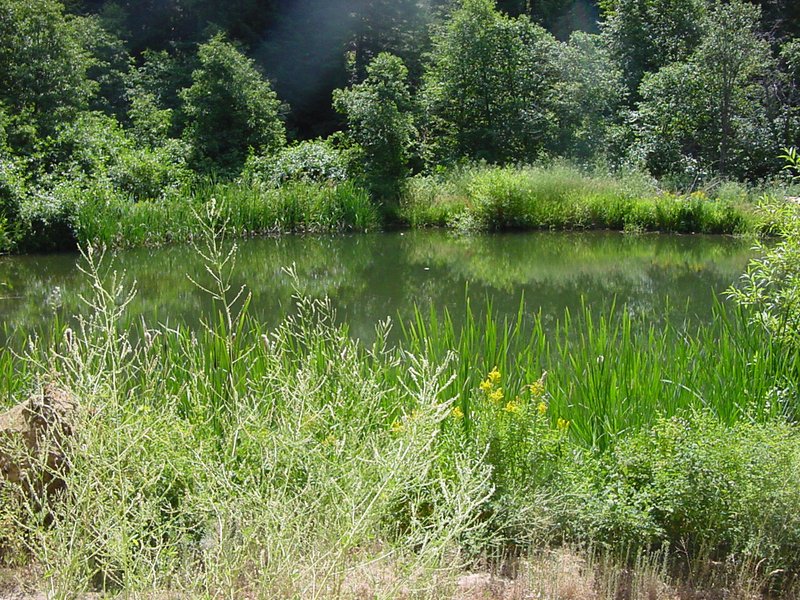 A pond on Beaver Creek, one of the Wenatchee River's tributaries. 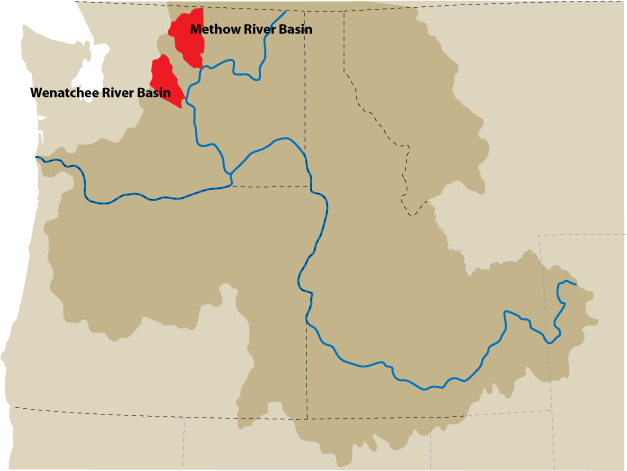 The Wenatchee and Methow river basins are in northern Washington. 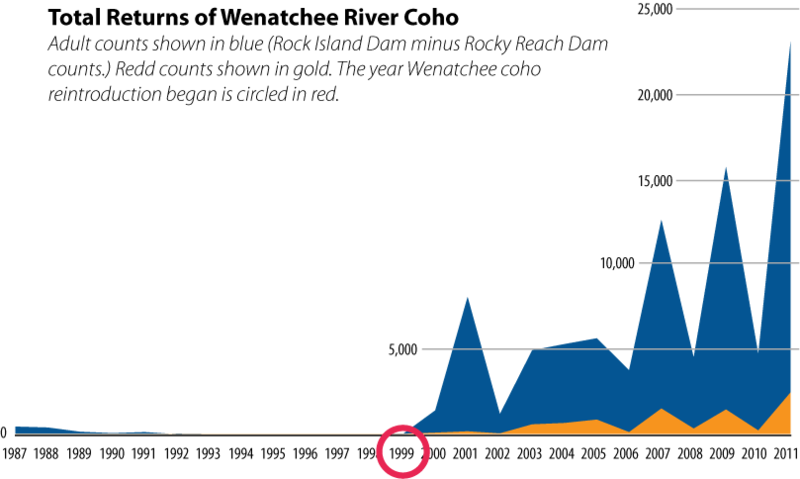 Total returns of Wenatchee River coho, adult counts shown in blue (Rock Island Dam minus Rocky Reach Dam counts). Redd counts shown in gold. The year Wenatchee coho reintroduction began is circled in red. Tending to coho eggs in the hatchery.